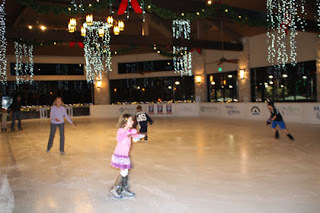 Always one to try new adventures, I find myself lacing up ice skates and stepping gingerly onto the 3,800 square foot ice rink at Austin’s Barton Creek Resort & Spa. I’m not exactly gliding on ice, but I do manage to work my way around the rink in semi-relaxed form. Yes, ice skating is fun, even for Texans who consider it strictly a spectator sport. Barton Creek Resort’s ice rink in the Resort Pavilion is open to the public through January 2. 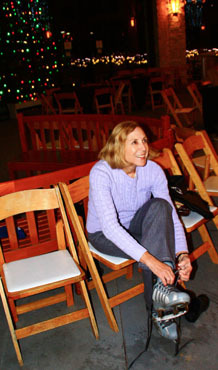 This is the second year local residents, club members and resort guests have an opportunity to lace up their skates and enjoy festive holiday cheer with friends and family. In addition to the ice rink, a display of 200,000 twinkling lights--part of the Holiday Lights & Ice exhibition—glows in a variety of deer, tree, and gift configurations. Ice skaing at Barton Creek is great family fun. 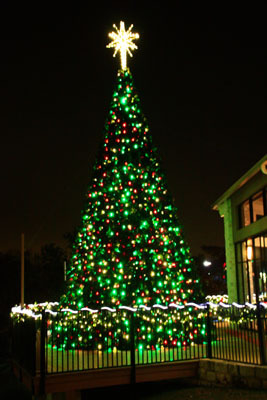 “We are excited to offer the Holiday Lights & Ice program again this year,” says Barton Creek Resort & Spa General Manager James Walsh. “It is a great way to enjoy the holiday season while also giving back to the Austin community through the Make-A-Wish Foundation®.” A portion of proceeds, about $20,000 according to Kelly Clarke, director of marketing communications, will be donated to the Make-A-Wish Foundation® (www.cstx.wish.org) of Central and South Texas. Holiday lights make the ice seem more magical. Guests can enjoy the skating rink with all-day skating passes, which start at $25 for children and $35 for adults. Individual skate sessions are also available starting at $16 for children and $21 for adults. Seasonal treats including hot chocolate and s’mores will be available. Skating-inclusive overnight packages are available at the resort, and the rink is available for private events and field trips. was held again this year. 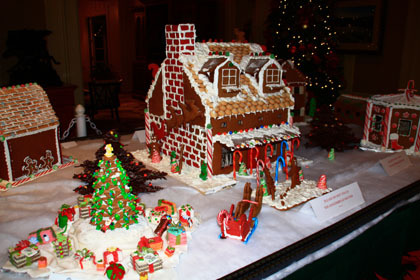 While visiting Barton Creek Resort for your skating adventure, be sure to check out the gingerbread houses on display in the hotel lobby. Fabulously detailed gingerbread creations were judged in professional and amateur categories, with winners receiving charitable donations. 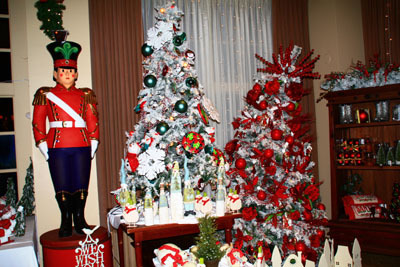 Another favorite spot is the Holiday Shop, beautifully decorated in colors and themes of the holiday season (I love the teddy bear tree!). Even if you’re not in buying mode, it’s a lovely place to browse (check out the personalized ornaments and Texas-themed gifts—in orange, no less). 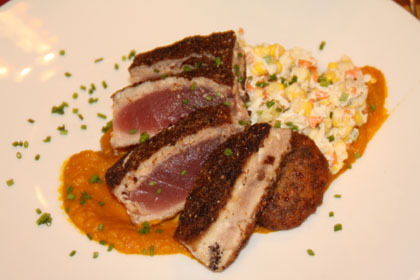 When it’s time for lunch or dinner, you can order food to be served beside a toasty fire at the ice rink. 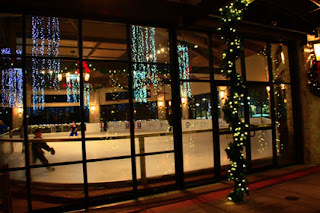 Satisfied that I stayed upright during my ice rink experience, I decide to shed the skates and dine at 8212 Wine Bar and Grill. Following Kelly’s recommendation, my husband and I start with the pork nachos (yummy) before choosing short ribs and tuna as our main courses and finishing with a pecan tart. Located in the heart of Texas Hill Country, award-winning Barton Creek Resort & Spa provides superb service and casual elegance in a luxurious setting (but don’t let those accolades deter you from going there). Designated the #1 golf resort in Texas, Barton Creek boasts four nationally acclaimed championship courses as well as the state's only Callaway Performance Center. For overnight visitors, the resort features 312 spacious guest rooms, a newly renovated full-service spa, superior dining experiences, and exceptional meeting and wedding facilities. For more information, call 1-800-336-6158 or visit bartoncreek.com.